Support the Businesses Who Support PathWays PA! If you shop this weekend, please keep in mind the businesses that provided sponsorship and auction items at our events this year! Take action on equal pay - by asking Senators to vote against an equal pay bill. Sounds a little strange, I know. But a supposed "equal pay" bill currently before the Senate called the Workplace Advancement Act wouldn't actually help when it comes to equal pay. Here are some details from our friends at NWLC, who are also offering a way to take action here. Several key legislative proposals that affect Pennsylvania's 20,000+ youth who experience homelessness are stalled in Congress. Will any of these bills become law? What happens if they do not? Find the answers to these and other questions at the inaugural "Legislative Briefing about Youth Who Experience Homelessness." The forum will discuss with Senator Robert Casey's Legislative Director the current federal legislative status of the Education for Homeless Children and Youth, the Runaway and Homeless Youth and Trafficking Act, and two other bills. On July 16, the U.S. Senate passed the Every Child Achieves Act, S. 1177, by 81-17. This legislation reauthorizes the Elementary and Secondary Education Act, including the education subtitle of the McKinney-Vento Act. The House passed its ESEA reauthorization bill, the Student Success Act, H.R. 5, by vote of 218-213. If you live in Pennsylvania, don't forget to vote today! Your vote matters more than ever, especially when it comes to the policies that affect women, girls, and families like the ones we serve every day. If you need more information on where you are registered or who is on the ballot, please check out our post from last week. 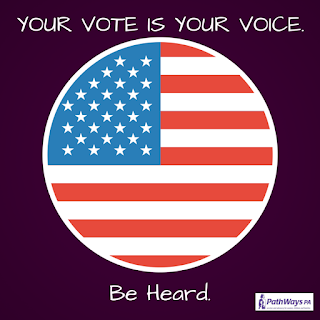 You can learn more about PA elections and get voting questions answered at www.votespa.com. Votes PA even shows demonstrations of the voting machines in your county! If you have any problems at the polls, please call 1-866-OURVOTE. The Low-Income Home Energy Assistance Program (LIHEAP) is scheduled to reopen November 2, 2015. LIHEAP is a cash grant sent directly to utility companies to help low-income households pay heating bills. You can apply for LIHEAP online, using a paper form, or at your local County Assistance Office (CAO). There is also a LIHEAP hotline available Monday through Friday (individuals with hearing impairments may call the TDD number at 1-800-451-5886).